Elk Grove's Economic Development Department is recommending the Elk Grove City Council approve an $8 million incentive being sought by Pappas Investment for a new Costco store. The recommendations justifying approval of the controversial multi-million dollar incentive are contained in a staff report from the City's Economic Development Director, Darrell Doan. 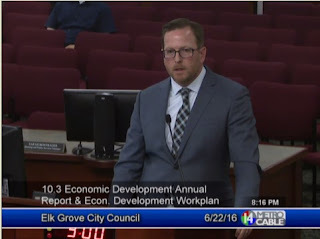 The staff report was released on Friday, April 8 as part of next Wednesday's regular Elk Grove City Council meeting agenda. As part of the recommendation, Doan says the proposed location near Elk Grove Boulevard and Bruceville Road is "Costco’s first choice for developing an additional store in southern Sacramento County, and that its second choice is property just outside and to the northwest of the City’s jurisdiction." Although the report does not specify any particular alternative location for store, the 800-acre Delta Shores in Sacramento, which is currently under construction, is located adjacent to Elk Grove's northwest side. Currently there are no membership warehouse stores like Costco or Walmart's Sam's Club planned for that shopping center. See video of Delta Shores below. Pappas Investments, through its The Ridge EG East, LP subsidiary says, according to the staff report, that without the $8 million incentive, the 17.43-acre site would not be economically viable. Pappas' targeted return on investment is 14.4-percent, and without the incentives, the "Landowner has indicated that its IRR [internal rate of return] for the Ground Lease is negative 15.92%. A negative or lower return on investment for this type of project would not, based on the Landowner’s representations, induce it to move forward." In laying out several of his justifications for approving the incentive, Doan says over the life of the 25-year incentive, the Costco store will generate in excess of $27 million in sales tax revenue, and absent " the economic incentive, the project would likely not be built in the City, resulting in 100% of the Costco sales tax never being realized. " Next Wednesday's meeting starts at 6 p.m at City Hall. No Comment to " Pappas Investment-Costco Kickback Deal Recommended by Elk Grove Economic Development Director "